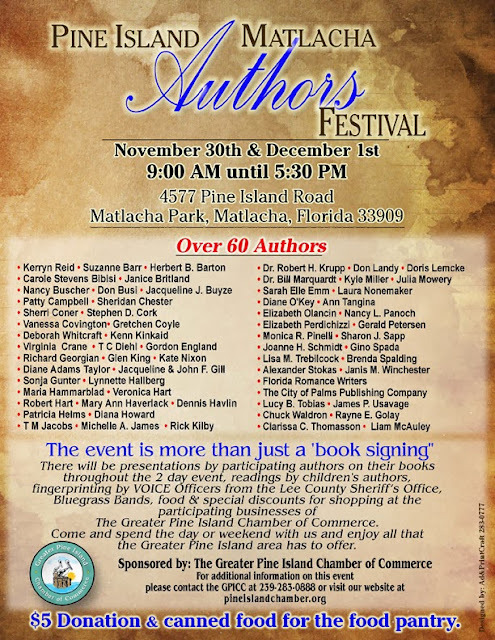 Florida Book News: Matlacha Authors Days! Want an unmatched opportunity to promote your book, your writing, and yourself? Matlacha Authors Days provides you the opportunity! This two day event, held in beautiful Southwest Florida, will feature 100 Florida authors. This is not just another “book signing.” Each author will have a chance to speak about their books and writing in our presentation tent to increase and create their fan base. The event will be heavily advertised with 70 TV ads appearing on local NBC & ABC affiliates that have access to a million viewers from Sarasota to Naples. Every author participating will appear in the TV ad at least 10 times the week before the event. Requirements – books must be edited, the author is responsible for their table & chairs. Tents – recommended and up to 3 authors are welcome to share a 10 x 10. The Matlacha community is renowned for its artists, authors, and crafts. People visiting this “Bohemian” village that’s on the water have an opportunity to see Florida in the “fifties.” It has its own “following.” After a visit you’ll know why. PS – Bring a fishing pole.